To become a national model for designing and implementing a replicable neighborhood-based social youth entrepreneurial program that builds 21st Century skills among struggling urban youth. 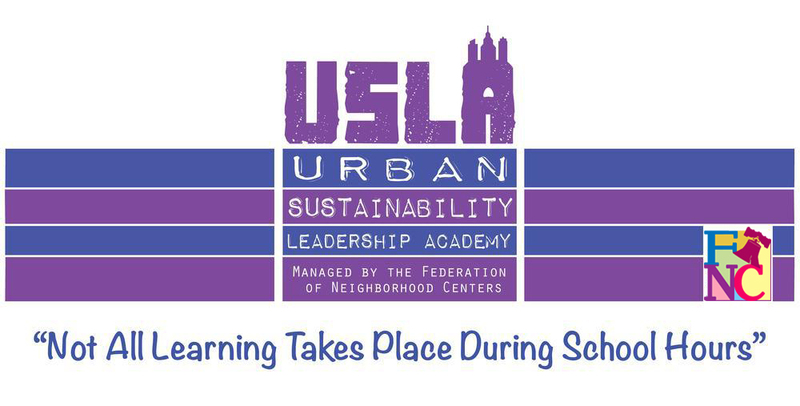 The primary goal of the Urban Sustainability Leadership Academy (USLA) is to create life-long learners who have the character, knowledge, skills & desire to continually cultivate what is best within themselves, their communities and the world at large. This is achieved through an innovative curriculum that utilizes social youth entrepreneurship, which integrates youth development, sustainable community development and community capacity enhancement such that youth are a critical element of each. Interventions merge youth assets, neighborhood development and community service that ultimately enable youth to transform themselves while changing their communities. In this model, students are not consumers, but rather are creators of marketable goods and services that address real-world problems. product development, sales, marketing, networking, web-design, health and nutrition, and work readiness soft and hard skills through running an urban farming business. In addition, all students are provided homework assistance, college prep and financial aid assistance, case management, work-readiness, and adult mentoring. In 2014-2015 100% of participants graduated from high school and received placement in post-secondary education. 100% of the USLA students created & executed service-learning projects that positively impacted their communities and rejuvenated community pride, including community workshops on composting, park cleanups, and health and wellness fairs. 95% of USLA students have successfully completed paid internships and have worked for both majorcorporations & small businesses such as: ARAMARK, Brown’s Superstores, Blue Cross Blue Shield,Manayunk Development Corp., Korean Community Development, Philadelphia Free Library, & Arthur Ashe Youth Tennis & Education. USLA graduates have gone on to universities such as: Drexel, Temple, Pierce College, Community College of Philadelphia, East Stroudsburg University, and Penn State.